The city of Richland is situated in Benton County, in southeastern Washington. It is located where the Columbia River meets the Yakima River, and not far from where the Snake River meets the Columbia. Richland and the cities of Pasco and Kennewick, which are not far from Richland, form the Tri Cities of Washington. Humans have lived in the area where Richland Washington is today for more than 11,000 years. It was first called Chemna, when the village was home to Indians who survived by hunting small game and gathering berries and other greens on the surrounding hills. They also fished for salmon, as the village was situated at the mouth of the Yakima River, or the Tapetett River as they called it then. The site where the village was is now called Columbia Point. Later, on October 17, 1805, the village was discovered by the leaders of the Louis and Clark Expedition who followed the Columbia River on their way to the Pacific Ocean. In 1864, the first white settlers, John B. Nelson and his family, arrived at the mouth of the Yakima River and settled in the valley near the river mouth. In 1880, Benjamin and Mary Rosencrance settled in the south side of the river, and in 1888 they claimed 1,700 acres on the northern side of the river. The Benton Land and Water Company was formed in 1892 by Nelson Rich and Howard Amon. They founded the town that we now know as Richland. The first Richland post office was opened in 1905, and the town’s name was listed as Benton. To avoid confusion with another community in Washington, also called Benton, the post office requested that the town’s name should be changed to Richland, for Nelson Rich of the Benton Land and Water Company. The town was incorporated as a Washington Fourth Class City on April 28, 1910, and the first mayor, J.W. Randall, was elected by the residents. In August 1943 the little farming village had a population of about 300 people. During World War II, the city experienced significant growth. By the end of the war, in August 1945, there were 25,000 residents. 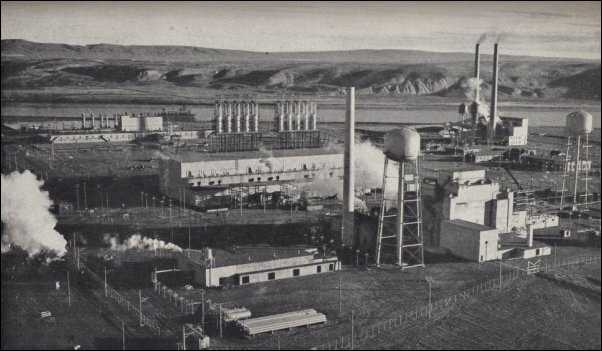 In 1942, the federal government decided that Richland Washington was the perfect location for their Manhattan Project, which involved the development of the atomic bomb during World War II and the construction of facilities to create the world’s first nuclear weapons. The US Army purchased 640 mi2 (1660 km2) along the Columbia River for this project. Richland became a First Class City in 1958 and the city continued to grow as the weapon production climbed during the Cold War years. As Richland grew, the city established services such as water, waste, and electric utilities, police services, fire protection services, public facilities, libraries, parks and other recreational services, and the maintenance of city streets. Today, many residents of Richland are employed at the Hanford site to help with the cleanup mission to restore the site. This cleanup effort costs more than $2 billion a year. Meanwhile, Richland still continues to grow. In 2000, the city had a population of 38,708 people, 41,000 people in 2002, and 42,660 residents in 2004, and about 43,520 in 2005. The Richland area has the highest per capita income in Washington State.